Service Costs > How Much Does Raccoon Removal Cost? Raccoons can be a pest at just about any home out there. If you have this animal bothering your yard, getting into your trash cans or even destroying parts of your garden, an expert may have to be called in order to removal it properly. For those who are in a bad situation, you may find these raccoons in your attic or even in your home. The price for removal is going to vary depending on the size of the job, where the animal is located, your geographical location and how many are there. Many services will give you a free consultation right over the telephone. As long as you explain the situation in detail, they will try their best to give you a good ballpark figure. The average cost of an animal control service is going to average anywhere from $100 to $200 just to come to inspect the home. On average, most companies are going to charge anywhere from a home visitation fee, and in addition to that, $90 to $275 per hour will be applied to your bill. It’s hard to pinpoint an exact quote because each job will be very different. To simply cage and trap the animal, a service will charge about $150 to $225; this will be your cheapest option. To remove raccoons from the attic, it will often start around $275 and can cost as much as $700+ to successfully cage and remove them. This can be much more complicated, especially if there are more than one. Trapping fees may also occur. Once the raccoon is trapped, the company will come back out and take the animal away to a safer location. Those who want to capture the Raccoon itself, a simple cage can cost anywhere from $40 to as much as $125. In order to capture the animal, the cage will have to have some sort of bait, as well as set up in a spot where it can be captured. 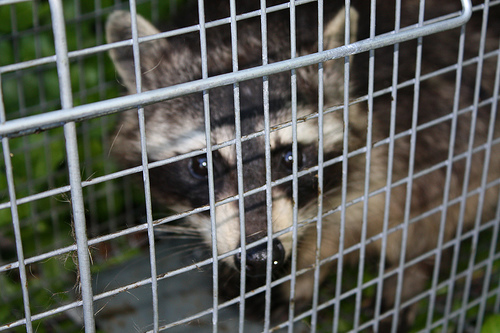 AAA Animal Control, for example, charges a $129 service and trap setup fee, along with a $50 per raccoon removal charge. During the first visit, a technician will visit your home and inspect your property. During this time, they will determine the damage done and how many raccoons are roaming your property. With this information, they will be able to provide an accurate estimate. He or she will discuss the removal methods, which repairs they can do and will try their best to work with your budget. Humane raccoon removal services will often bait and trap the mother if they think she has babies in the home. If they can successfully do this, they will proceed to remove the babies by hand and take them miles away from the home to a safer location. Even if there are no babies, most services will trap until the group is gone, and they will release them into wild miles away from your home. An emergency situation may result in a premium fee. Since many animal control experts have 24/7 services, ask what they charge for a premium service. Usually, this premium will be charged during the weekend, at night and during holidays. Since some raccoons can get into the home, such as the attic, they can leave a mess behind. Most services will clean up the area the animal destroyed. Whether drywall needs to be replaced or the floorboards need to be bleached, these services will be an additional charge. If the raccoon were to be found under your foundation, the company will often recommend an exclusion barrier to keep them from entering in the future. This can cost $10 to $20 per linear foot. Raccoons tend to hang out in groups that can be as large as 12. If you have a problem and you only spotted one raccoon, there’s a rather good chance there are others hanging around somewhere. Raccoons tend to look for a dry, safe place to have her babies. Common places where raccoons are going to be found will include the attic or chimney. If you see one near your chimney, there’s a good chance they are having their babies inside. Unless you know what you’re doing, it’s best to call the animal control company when the problem arises for the first time. While you may think plugging the hole in your attic may work, you may have trapped the animal inside, forcing it to chew through the walls to get out. Or worse yet, if the mother can’t get back into the chimney, this can lead to unnecessary noises or babies who won’t survive, leading to a few carcasses left to rot. This will just lead to unnecessary repair bills. Intimidating the animal when you see it can often cause it to leave with its young. If you’re finding the raccoons tipping over your garbage cans, tie a bungee cord around it to prevent it from opening. Always check your local regulations to see what is and what isn’t legal. Where do raccoons live? Raccoons tend to live in hollowed out trees, in burrows, below rocks or in brush piles in the wild. However, if they live in an urban environment, they may live in an abandoned car, chimney, attic, crawl space or a similarly protected space. They will travel up to 18 miles to forage for food and are extremely adaptable. Are raccoons dangerous? Like most wild critters, they tend to scurry when they see a human; however, if you were to come in contact with one, keep in mind they are the primary carrier of rabies. Raccoon droppings can also be dangerous, often carrying dangerous diseases such as Leptospirosis, Salmonella and raccoon roundworm. Do raccoons attack humans? Unless rabid, they won’t attack a human. Even if rabid, they will only feel threatened if you corner or attack them. Consider removing the animal itself. There are many cages that are fairly easy to set up that won’t cost you more than $50. Some of the best ways to get rid of these pests on your own can include sealing off the entrance as well as smoking out the animals. When trapping, however, choose a large sturdy cage, preferably at least 12″x12″x32″ in size. If you are able to trap one, be sure to take it at least 10 miles from your residence. Compare at least three pest control services. Websites like HomeAdvisor.com allow you to find pest control companies in your local area. All you have to do is explain your situation and the contractors will email you their quote. Used Attic Solutions. Very professional low cost compaired to others and also did all the repair work and clean up.